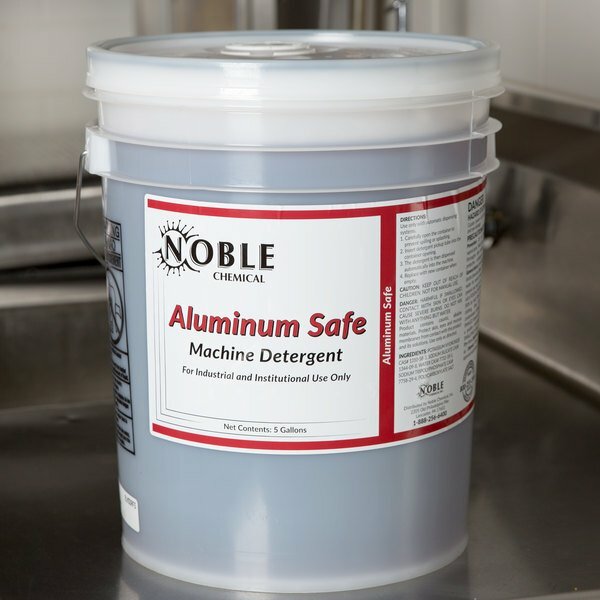 Clean your dishes with this Noble Chemical Metal Safe dishwashing liquid. 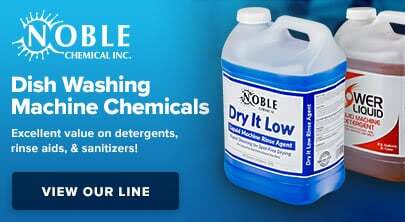 The Noble Chemical Metal Safe dishwashing liquid effectively removes hardened food particles to give your dishes a clean and bright shine. 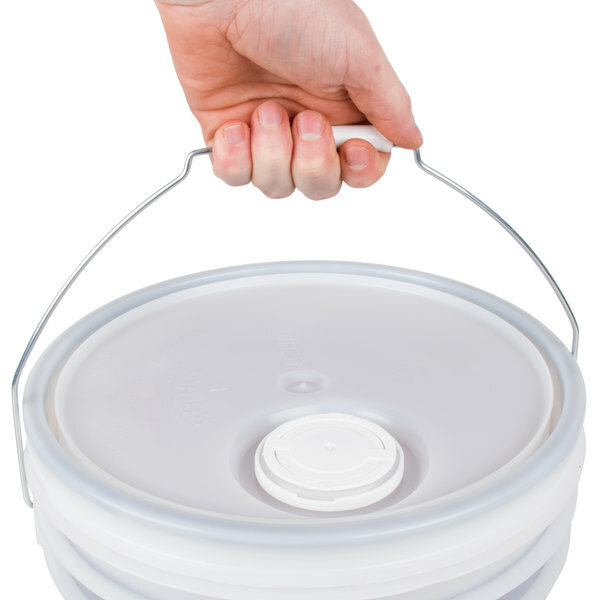 Its unique, low-suds formula is aluminum-safe, giving you the ability to clean a wide variety of dishes in one cycle. Not only will this save you time when cleaning up your kitchen, but it also saves water and makes your warewashing system more efficient. 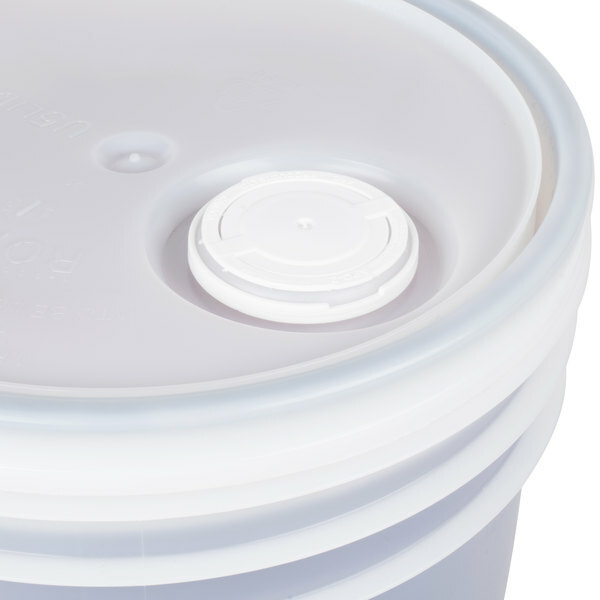 Thanks to its bulk 5 gallon size container, you’re sure to always have enough dishwashing liquid to clean up your kitchen, even on your busiest nights. 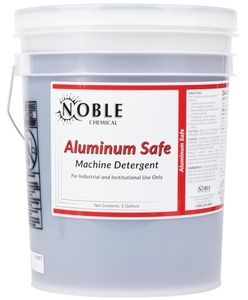 "This is an excellent versatile Detergent. It leaves everything sparkling clean and doesn’t discolor aluminum. The price is excellent for the amount of product. I plan on purchasing this again." 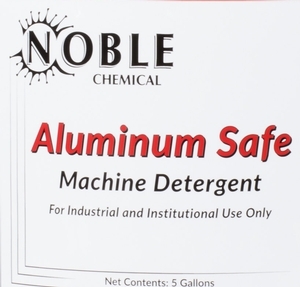 To use this Noble Chemical Metal Safe dishwashing liquid, simply hook it up to your commercial dish machine according to the instructions printed on the label. Dispose of used containers when empty. 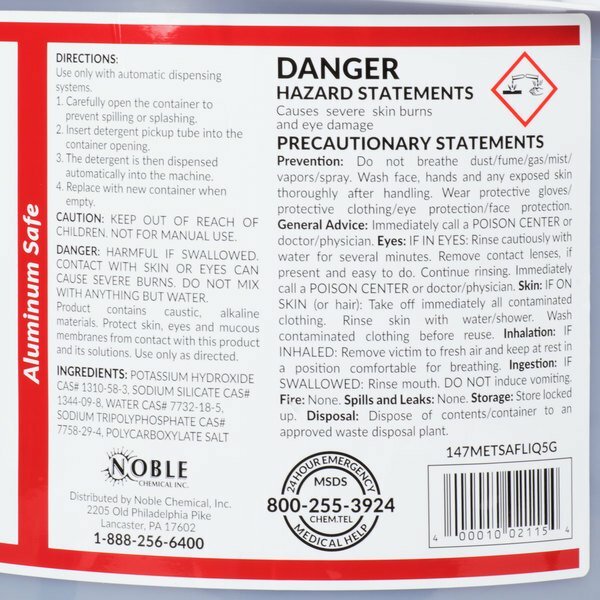 For your convenience, this product will remove hardened food particles safely from your aluminum cookware and servingware. 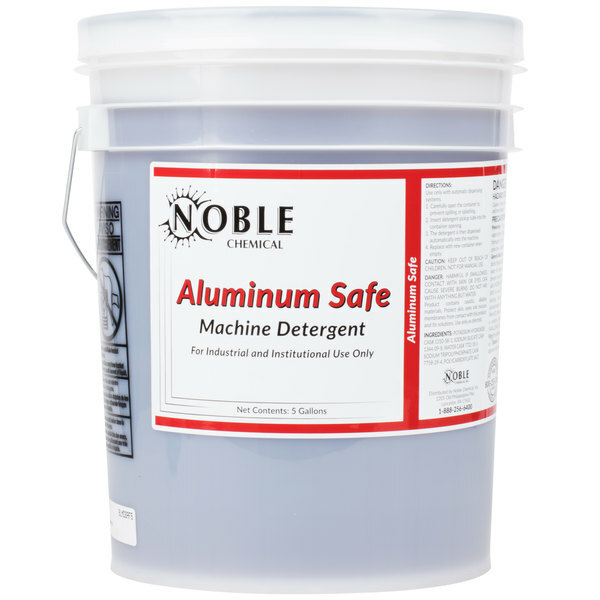 This is also safe for use on other soft metals such as silver, gold, and pewter. 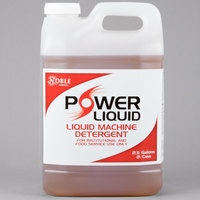 This dishwashing liquid can be used in either high or low temperature dishwashing machines, for use in any facility. 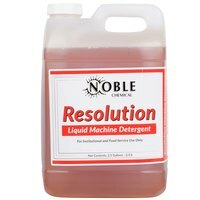 Noble Chemical brand supplies are a smart addition to any restaurant, hotel, or healthcare facility, and this handy dishwashing liquid will keep dishes sparkling. Be sure to check out our quantity discounts for even better wholesale savings! 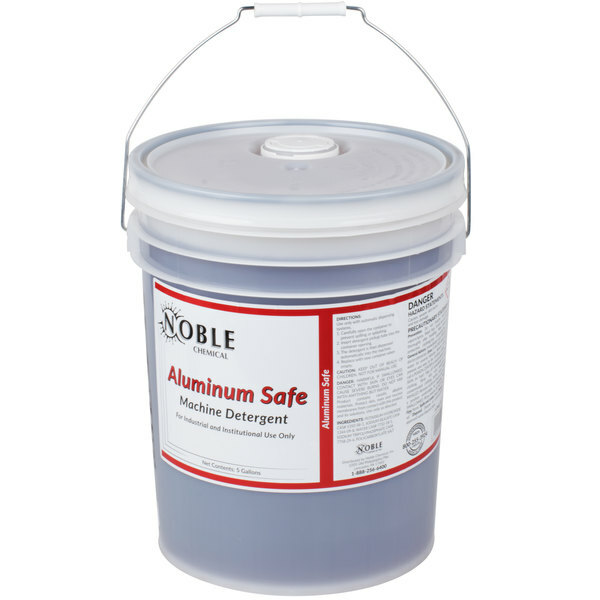 Item #: 147METSAFLIQ5G Noble Chemical Metal Safe Dishwashing Liquid 5 gallon / 640 oz. 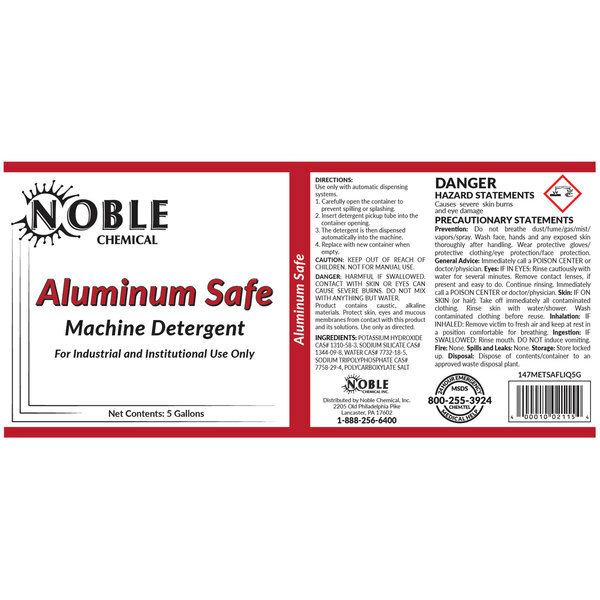 Overall User Rating: Noble Chemical Metal Safe Dishwashing Liquid 5 gallon / 640 oz. This is an excellent versatile Detergent. It leaves everything sparkling clean and doesn’t discolor aluminum. The price is excellent for the amount of product. I plan on purchasing this again. this dishwashing liquid never fails us when it comes to making sure our dishes are sparkling clean. It definitely gets the job done better than the rest, leaving our dishes with a very nice shine. We highly recommend this product. 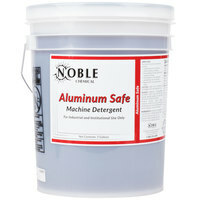 The Noble Chemical Metal Safe Dishwashing Liquid 5 Gallon works great! It leaves dishes sparkling clean with no residue. The price is great too. I would purchase this again.